One of InDesign's hallmarks is its capability to open documents from some versions of QuarkXPress and PageMaker and convert them to InDesign documents. (If any of these files' formats aren't supported in InDesign, you get the Warnings dialog box shown in Figure 3.) It cannot open documents created by Microsoft Publisher, but Markzware does offer a utility to convert Publisher files to InDesign format. Figure 3. 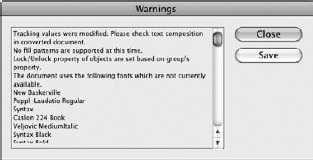 InDesign shows the Warnings dialog box if there are any conversion issues when importing foreign file formats. If your QuarkXPress document relies on XTensions (a type of plug-in) to add capabilities (such as table creation), it does not convert correctly into InDesign and may not even import at all. Examples include any documents built with QuarkXPress's indexing and book features. The QuarkXPress leading model is different from that of InDesign, so expect leading to sometimes vary significantly, especially if you use additive leading as the automatic leading method in QuarkXPress. Special gradient blends, such as the diamond pattern, are converted to linear blends or circular blends. Text on a curved path is converted to regular text in a rectangular frame, even though InDesign supports text on paths. H&J sets don't have an equivalent in InDesign, so they do not convert, although any H&J settings are carried over into the converted paragraph styles. Relaunch InDesign or, if necessary, restart your computer and then launch InDesign. If automatic-recovery data is available, InDesign automatically opens the recovered document and displays the word Recovered in the document's title bar. This lets you know that the document contains changes that were not included in the last saved version. If you want to save the recovered data, choose File => Save or Ctrl+S. Recovered is removed as part of the file name, and InDesign asks whether you want to overwrite the old file. Overwriting the old file is easier than choosing File => Save As or Ctrl+Shift+S and then typing a name, unless you do want to save a copy of the file in case you want to go back to the old version later. If you want to use the last saved version of the document (and disregard the recovered data), close the file (choose File => Close or Ctrl+W) without saving and then open the file (choose File => Open or Ctrl+O). What Does the Check In Menu Option Do? Adobe Creative Suite 5 no longer includes the Version Cue application and its companion Adobe Drive application that let you create shared folders for projects and save multiple versions of a layout or other file within that project, so people could review changes and even go back to an earlier version. So you might be wondering why the InDesign CS5 File menu has the Check In option that had been used to open such Version Cue projects. The answer is that even though Version Cue is no longer part of Creative Suite, Adobe is letting developers still use it with their content management systems via Adobe Bridge. So, the Check In menu remains in InDesign in case your company has implemented Version Cue in its content management system. You'll know if that's the case in your work environment because the Check In menu will be black, indicating its availability. But for the vast majority of users, the Check In menu option will remain grayed out because it serves no purpose in a standard InDesign CS5 or Creative Suite 5 implementation. Sometimes, InDesign can't automatically recover the documents for you. Instead, it gives you the choice of recovering any files open during a crash or power outage, saving the recovery data for later, or deleting the recovery data. You typically want to recover the files immediately.